In this case, a Softimage user reported that on a machine where Softimage had worked on consistently for years, XSI.exe was now crashing at startup with the “Failed to save scene before system failure” error. He’d done all the troubleshooting steps, but still hadn’t found a solution. It’s hard to resist a challenge like that, so I got my hands on the Process Monitor log, and it turned out to be a bit of an easy case. 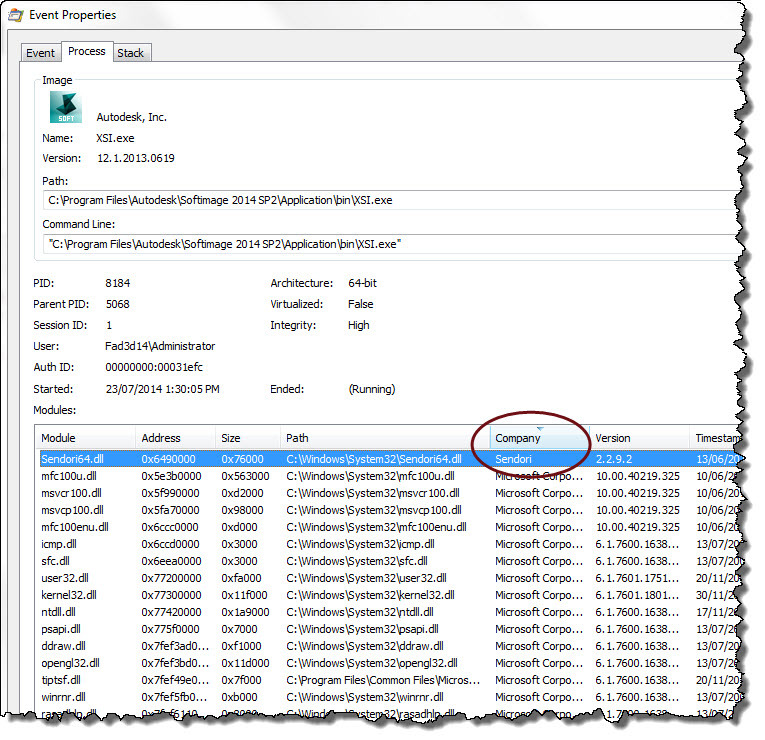 I went through the Process activity, and just before the crash (you can tell the crash point by where XSI.exe does a ProcessCreate on senddmp.exe), I took a look at the DLLs loaded by XSI.exe. Usually you’re looking for something that doesn’t belong, and when I saw Microsoft, Autodesk, Flexera, Apple, Apache, and…Sendori??? I thought I might have something. The Google results for Sendori were a bit sketchy (a DNS redirector, yikes), so we removed it, and that fixed the startup crash. ERROR : 2000 - Failed creating scripting engine: VBScript. ERROR : 2000 - Failed creating scripting engine: JScript. It turns out the problem is related to McAfee antivirus, which for some reason has overwritten some important VBScript and JScript registry values. You’ll find a number of other pages on the Web about this. For example, here’s a thread on sevenforums.com. Note that fixing just VBScript is probably sufficient to get Softimage to start, but you’d still be missing JScript. 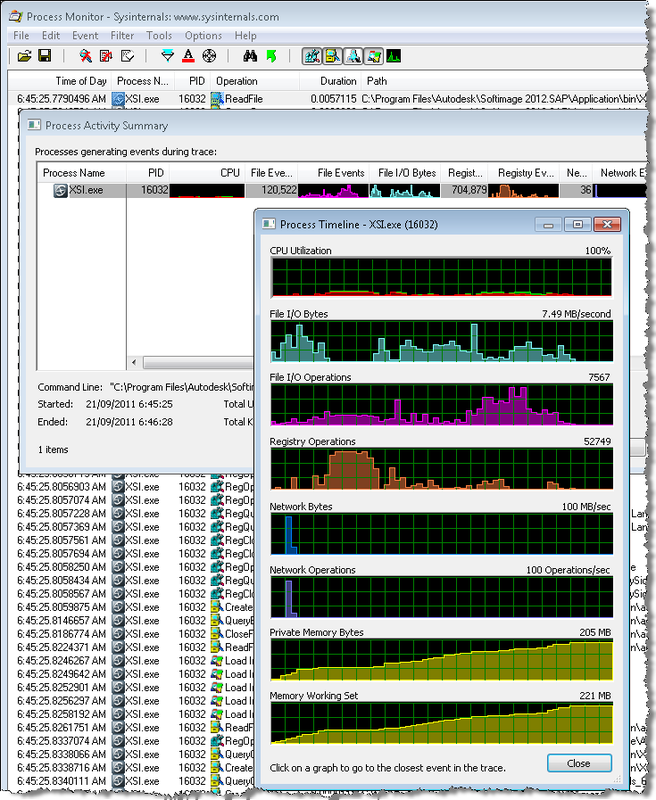 The other day, I ran Process Monitor to check out the Softimage 2013 startup. Softimage 2012.SAP took about 44 seconds to start up. Softimage 2013 took about 42 seconds to start up. 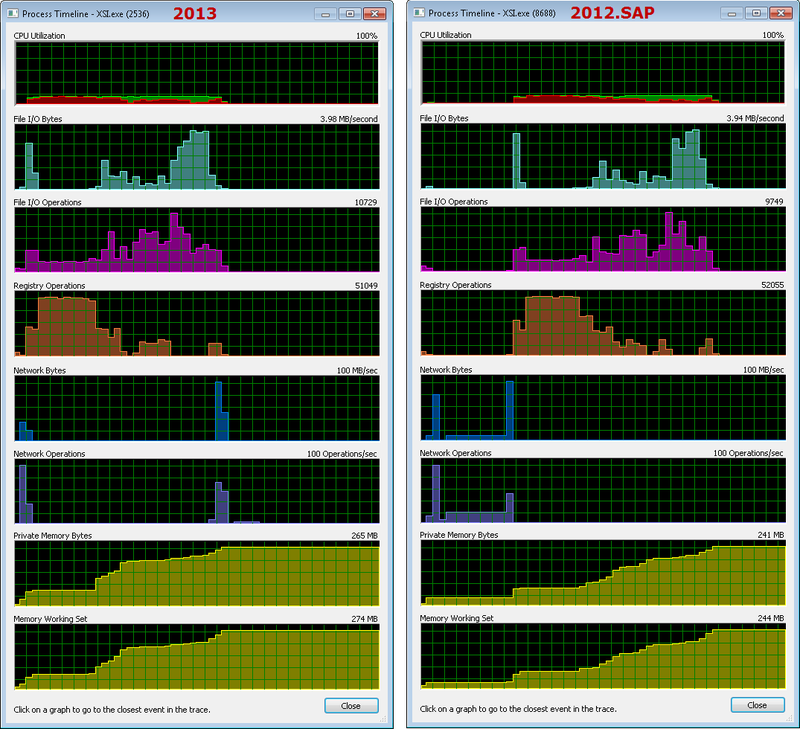 The process activity for 2012.SAP and 2013 look pretty much the same, except that 2013 does all its file and registry activity sooner, rather than later. I don’t know if that’s signficant (my 2012.SAP is an existing install that’s been there for awhile, while I just installed 2013 the other day). One interesting thing I noticed is the Read Bytes info in the File Summary for Softimage 2013. Notice how ICE compounds are at the top of the list. Softimage 2013 loads about 53MB of .xsicompound files. Basic troubleshooting for when you cannot start Softimage, or you get strange errors at startup, or you cannot perform basic tasks such as creating primitives or duplicating objects. Or for fixing Softimage after you run a registry cleaner. Run runonce.bat to re-register the Softimage DLLs and SPDL files (SPDL files describe the parameters of objects and operators in Softimage). runonce.bat does a lot of what happens during installation and it is a lot faster than removing and then reinstalling Softimage. If you have both 32- and 64-bit Softimage installed, both versions will use the same User location. If you want separate User locations, you could modify the XSI.bat file that launches Softimage. 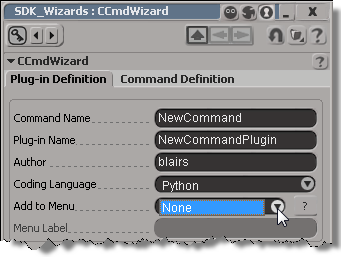 call "C:\Program Files (x86)\Autodesk\Softimage 2012.SAP\Application\bin\setenv.bat"
In this case, a customer reported that the Add to Menu list in the Command Wizard was empty. Normally, Add to Menu lists all anchor points for menus where you can add a custom command, but now it had just one entry: None. Based on this, it didn’t take to long to figure out the problem: the customer was starting Softimage with a shortcut to XSI.exe, so setenv.bat was never called, and XSISDK_ROOT was never set. XSI.bat is the way to start Softimage. XSI.bat calls setenv.bat to set all the required environment variable, and then starts XSI.exe. Instead of xsibatch -w or xsi -w, you could modify setenv.bat to create another .xsipref file in %XSI_USERHOME%\Data\Preferences. Whatever is in that file will override what is in default.xsipref. This does require you to edit setenv.bat, which isn’t so useful if you have a lot of seats. In that case, if you use a network deployment, you could deploy a %XSI_BINDIR%\SiteDeploy.bat file and use that to echo out the workgroup preference. The other day I was using Process Monitor to see where Softimage spent its time during startup, and I was curious to see how Softimage compared to the big two. So, here’s some numbers. I did this shortly after restarting my machine, so I didn’t have my usual kazillion different windows and apps open. Softimage didn’t have any workgroups, and Max and Maya were pretty much fresh installs. Total elapsed time is the time from the first logged event to the last. 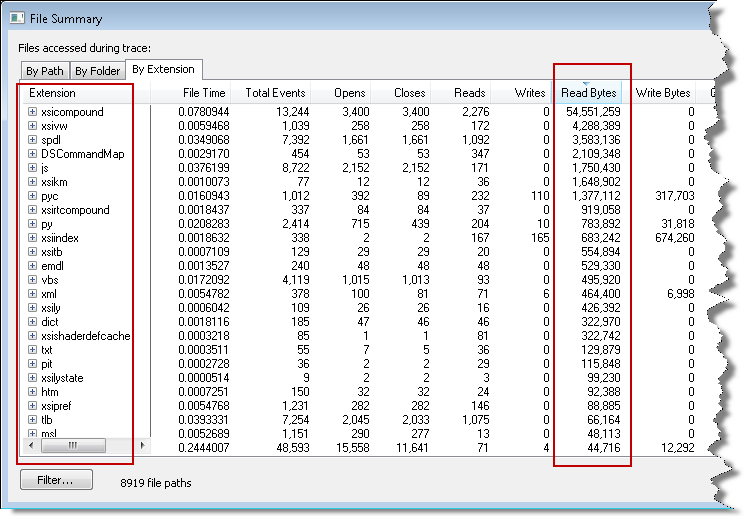 Duration is the sum of all event durations in the Process Monitor log. Softimage uses the registry way more than Maya or 3ds Max. Maya does more file i/o in terms of bytes, but Softimage has more file i/o operations. 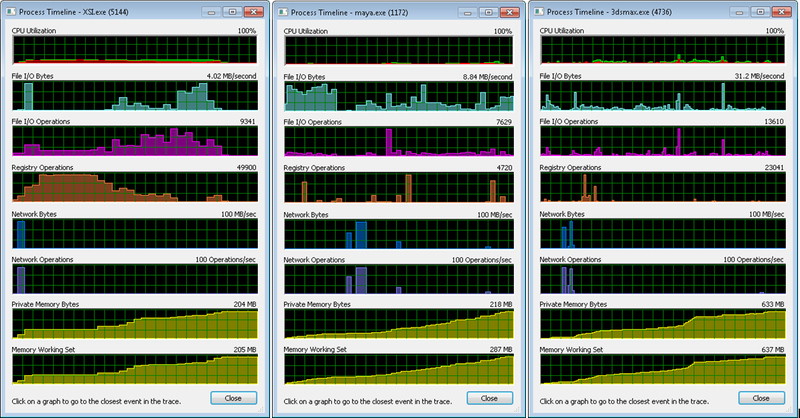 When a machine is more loaded up (more runnung processes), this is where Softimage spends more time. Here’s a few things you can do to diagnose slow startups. First, try starting Softimage in the factory-default configuration. The quickest way to do that is to simply rename your Softimage User folder. If you see a difference in startup times, then it may be due to workgroups or the addons and plugins you have installed. 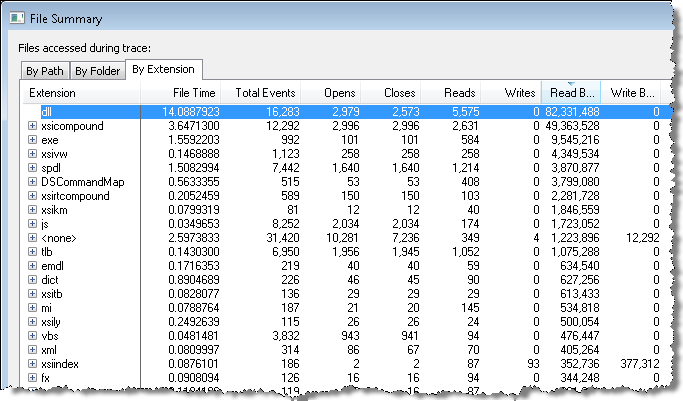 Another thing you could do is run Process Monitor to capture a log of all XSI.exe startup activity, and then check the log for any “suspicious” activity. All the entries are time-stamped, and you add a Duration column to see how long activity took. NOTE The time spent can vary from startup to startup, so I wouldn’t jump to conclusions based on just one log. I’d log multiple startups to see if there was a definite pattern. For example, one time I saw xsi.exe spend three seconds reading adlmint.dll, the next time it was less than .001s. This post is for Softimage 2011.5 on Linux, and for Google (I’ve posted about this before, but I didn’t include the strace output that time). then you probably need to put back our x11 patch.